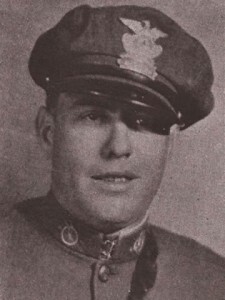 Officer William Blackett was killed when his motorcycle crashed into an automobile ahead of him as it was turning a corner. Officer Blackett, along with another motorcycle patrolman, were pursuing a speeder on Pico near 23rd Street when the accident occurred. Another car passed between the speeder and police, according to Chief Webb, and Officer Blackett collided with the other vehicle. Officer Blackett had served with the agency for four years.